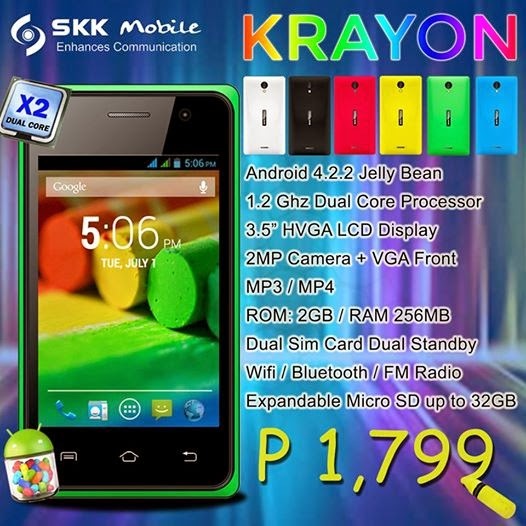 SKK Mobile recently announced its newest entry level android smartphone, which packs a 3.5-inch HVGA LCD display, powered by a 1.2GHz dual-core processor, 256MB ram and 2GB onboard storage that can expand up to 32gb via microSD card, the SKK Krayon. This Dual sim/Dual standby smartphone is equipped with 2MP rear camera and VGA camera on front. It also support wifi and Bluetooth connectivity. Runs on Android 4.2.2 JellyBean. The Krayon is available in White, Black, Red, Yellow, Green and Blue color variant.